A TV journalist’s on-the-job documentary while covering one of the most attended Catholic events in the Philippines. I have recently been commissioned by RT News as video journalist-fixer in the conflict zone Marawi, the city besieged by the Jihadist Maute group in Lanao Del Sur, Philippines. My primary concern, of course, is the camera. I have been contributing news videos since 2014 and my main camera has always been my Canon 60D DSLR because of it’s long battery life, nice bokeh and flippable LCD. For the interview audio, either I plug in a shotgun mic, a lavalier mic or use a separate audio recorder combined with a good phantom-powered lapel microphone. But Marawi assignment calls for a more run-and-gun type of camera. I didn’t want to be fidgeting on buttons and menus between takes in a war zone. I was going to acquire a good video camera for this but Gonzalo, my Spanish reporter, brought a Canon XA25 video camera. My career as a freelance video journalist is now at stake with this camera because firstly, I wasn’t familiar with it. Secondly, the onscreen menus and functions are in Spanish. You can imagine my ordeal. But of course, Gonzalo is kind enough to always give me a hand especially on the first day. Canon XA25 is rather small for a ‘professional’ video camera. I was like, ‘Oh, man, this is going to be painful.’ Because it’s always easier shooting a reporter live with a video camera that can be put on your shoulder but surprisingly, this cam is light and has a really good steady shot capability. It was a piece of cake, really, to be holding it with both hands. Now, my correspondents love walking while reporting. It’s dynamic, it gives the right feel for a war-zone coverage and shows the viewers around; but it can also be a real challenge for the cameraman because he’ll be watching for a lot of different things at the same time–framing, focusing, footing and audio. It means that I had to walk backwards while watching my reporters’ steps to synchronize mine so that we bounce at the same time to lessen jerks in the frame and make sure that I didn’t stumble while keeping him/her properly focused and at the center of the frame and be able to show whatever around us that he/she wants to show, like bullet holes on building walls, at the right time in the report as I listen and watch out for any ambient noise which might ruin the audio. With a DSLR, which works more or less like a 35mm film camera, I would be needing a camera assistant to take care of focusing and a camera stabilizer, like a Steadicam, to pull this off. With the Canon XA25, I did it–with relative ease. #1 – It has this intelligent face/multi-face detect feature which, once set with a tap on the screen, focusing was not an issue at all. Astounding! #2 – I couldn’t find the manual aperture setting. I didn’t have the time to study but I never needed it anyway. It seemed to give me just the right exposure. I think it comes with the face detect feature. For a while I was worried about it because most cameras, set at auto-exposure setting would give nasty and noticeable changes in exposure. That did not happen. #3 – I had difficulty isolating audio input channels. I think I tried every combination but both channels keep getting in. I must be doing something wrong but since my handheld mic level is clear enough, I decided to hit record even when the ambient sound from my shotgun mic is a bit too high for me. Upon editing footage, I was so happy channels were recorded separately. Meaning, I had separate controls for each channel’s audio levels. I was able to lower down ambient sound as necessary and enhance my reporters’ voices for better quality. Maybe this feature is not new for professional cameras but in such a small ‘news’ camera–it made me really want to have my own Canon XA25. #4 – Once in a hot-spot, I had my 300mm lens on my Canon 60D ready, which, with its image sensor crop factor, works like 480mm, to catch those house-to-house military activities from afar but I was amazed to find out that Canon XA25 can zoom in about the same distance–even a little closer. With my heavy flak jacket, it was a real treat having such a light professional, easy-to-use news camera. It was quick to draw when something comes up along the road. The only thing I probably want to come with this camera are big, long-lasting batteries because using it all day drained all my four batteries. It was New Year’s Eve and when my neighbor’s almost endless ear-damaging ‘Sinturon ni Hudas,’ a series of about 10-meter-long firecrackers meant to ward off evil spirits, and humans as well, subsided, I dozed off worrying whether my motorcycle parked outside would survive the night while monitoring fire alerts. It was this time last year when a huge fire broke out leaving 4,000 families homeless and three dead in Apolonio Samson district in Quezon City. 8 AM–I checked my Android. Boom! A fire broke out just right after the world faded to black for me at 2 AM. One dead on the initial reports and a thousand families affected. It was too late to run and get the footage which my news agency in Berlin would probably need. But after a couple of hours, an email came in. 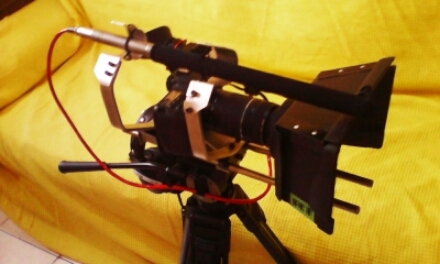 When I went to Apolonio Samson last year, I had a big rig with a 21-inch-long shotgun microphone and mattebox attached. It was difficult to get spontaneous shots as people cannot seem to help it goofing around a news camera. 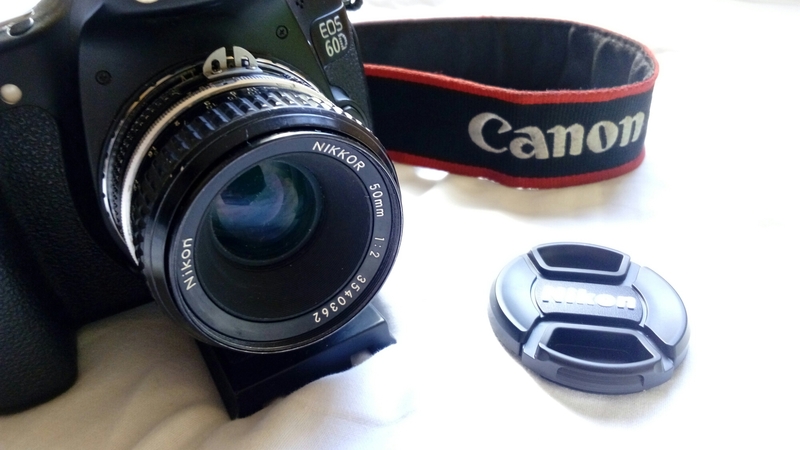 This time, I decided to bring just my Canon EOS 60D camera body, my good old 18-55mm kit lens for the wides, a 300mm zoom and my newest special, a vintage 1977 Japan-made Nikon NIKKOR 50mm f2.0 prime lens. Just like I thought, when I got to the still hot and smoking rubble, almost nobody waved a hand for the news. It was easier to capture the true mood of the area. I used a wired lavalier microphone for the interview, of course, but it was difficult getting it right. Leaving my rig means I did not have a matte box to cover my lens. Keeping eye contact with the interviewee, guarding the shot and audio levels while trying to get the right story is hard enough for a solo video journalist and then to top it all up, keeping the lens covered from sunlight with a hand, to keep my contrast as crisp as possible, makes it a whole lot harder. One thing I like about filming news is the unique kind of high that I get while trying to get the right angle, picking the right person to interview, getting the right images while trying to protect yourself and your equipment in the midst of the overwhelming drama unfolding before me. Making a film out of a script is great but making it out of a real-time chaotic setting under a hairline of time frame is crazy and amazing. This project is an infomercial for a leading Korean Karaoke brand. The product is awesome and superior in a lot of ways but the features are highly technical. The challenge was to make a fresh video that would stick and sell to anybody–from high-profile artists to simple buyers and sellers in Raon–a place in Manila where one can find almost anything cheaper than anywhere else. It must also sell even without audio because it will also be displayed in windows and places not so conducive to hearing what one is watching. And of course, everything must fit in a budget. So I wrote a script that would make a talent become three individuals to represent competition, shoot in one location but put them in three different ones and make them interact with each other to spice it up–possible only with green screen. 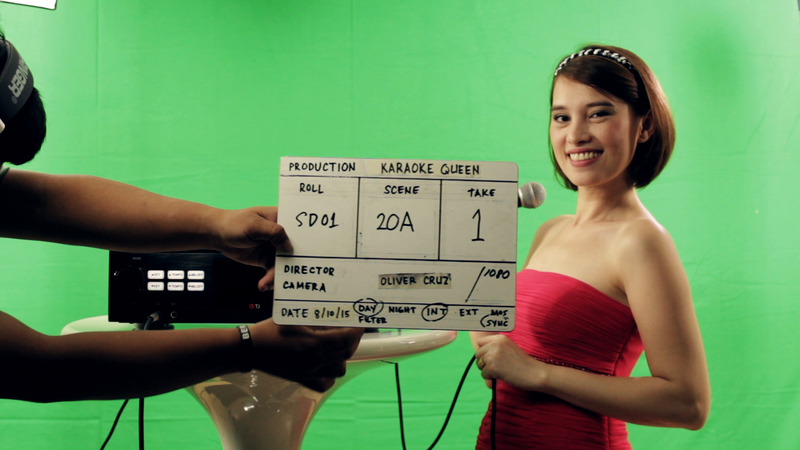 Shooting in green screen is easy if you plan ahead and make a detailed shot list. Filming three different characters with a single talent can become confusing and post production a mess if not done properly. With proper planning, shot list and a good slate, it’s quite simple, really. The only problem with green screen production are the heavy computer processing required of HD footage and the different layers of keying processes. Chroma setting would be different for the talent, her hair, the product and props as they have different shininess and reactions to light. There would be lots of tweaking, masking, keyframing, and sleepless nights. If you’re planning to shoot on blue or green screen, plan ahead, make a shot list with details of props, location, shooting time, wardrobe, etc. so you can shoot systematically. Shooting all sequences with the same scene settings in one sweep will make everything a lot easier and light. You will gain respect from everybody this way, as well. Light your subject and your background separately and keep your lighting on the green backdrop as even as possible. This will keep you keying process a lot easier. Avoid shiny props as these will reflect the green backdrop. Anything green on the recorded video gets invisible upon keying causing more editing time which you probably wouldn’t have. Have a backup audio recording. In my case, I recorded the talent’s voice via two wired lapel mics, the first goes to a Phantom-powered Zoom H4N and the second one goes directly to the camera. 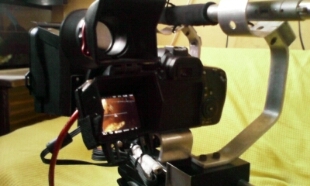 My DSLR audio recording is not perfect but when the first recording have irreparable pops, backup audio is the life-saver. One thing to keep in mind is the post production time frame. Yes, with a wild imagination, fresh ideas come out but they can also make post production become really tedious if not difficult. Submit a realistic and attainable schedule so you won’t put a lot of stress on yourself trying to beat your own deadline. You may have control on the execution of your story but not on you computer’s video rendering capability. Go easy on the blurs and avoid semi-transparent shadows and feathers. One trick to make editing and re-editing a lot quicker is to prerender the chroma keying and graphic elements in different layers so that if changes are needed to be done on your animation or subtitles, you would not have to render everything again and again. Graphic elements with alpha matte renders in seconds to a few minutes. Chroma keying however, can take a few hours depending on your tweaks and number of layers. It makes sense not to pre-render them together. I use PNG sequences for all my prerenders for optimum-quality output. Trash bag – it protected my camera and rig from remaining water cannons and water sprouts from broken pipes and rain. My pair of Converse shoes – it stood hot piles of debris and the murky puddles of charred wood, earth and ashes. To get to the core of this burnt 2.5-hectare settlement, I had to get through a still-hot and smoking remains of a house, come out of a window to the river dike and get through another rubble at the end of it then go through isles of debris. Everything is hot and smoking, if not wet, and the result–surreal. Children remember missing passengers of Air Asia QZ8501 at Changi Airport, Singapore.